Traditionally, brides get French manicures. They're just classic and classy. That's what I got for my engagement photos, although I didn't like how they came out at all. So I swore off French manicures for the rest of my life. Instead of getting one for my cousin's wedding last month, I did a solid color that matched my heels. If you're thinking about solid colors, you might want to think about using one from Essie's 2013 Bridal Collection. My friend just sent me the swatches of the colors. The four colors in the collection are meet me at the alter, my better half, using my maiden name, and no baggage please. Using my maiden name is perfect to go with my wedding color scheme, so if I had to choose, I would slip those in the bags for my bridesmaids. 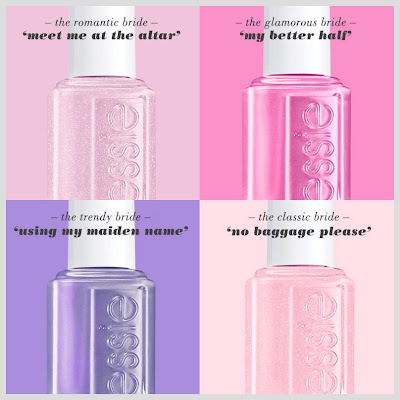 UPDATE: Check out Essie Bridal Collection 2015 here. BRIDAL BABBLE: Of the four in the collection, which one is your fave?